When Dungeon Defenders was released for the PC and home consoles, it immediately became a critical darling for its new take on tower defence, alluring art style, and loot-grabbing co-op action. 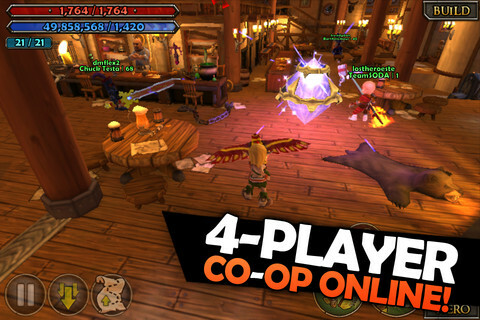 With Dungeon Defenders: Second Wave, Trendy Entertainment is attempting to bring its formula for success over to the world of smartphones. Can the game survive the transfer to a touch interface, or is this just one round of tower defence too many? The warrior heroes of the land are off to fight an ancient evil and their sweet children are left home all alone. As is typical for children left unsupervised, they manage to unleash an ancient evil upon the world and must defend against it, lest the adults come back and find their homeland in ruins. I don’t think “you’re grounded” would quite cut it. Dungeon Defenders: Second Wave puts you in the shoes of one of four of those meddling kids: the Apprentice, the Monk, the Huntress, and the Squire. Each of these is a basic archetypal RPG character class, the Squire is a melee fighter, the Apprentice a mage, and so on. 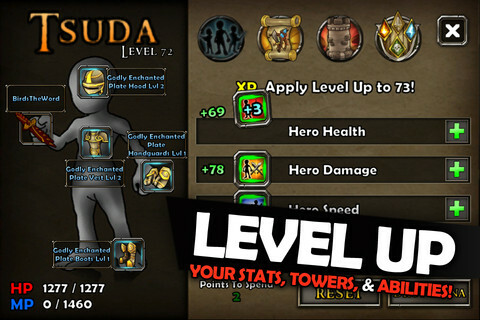 Each character can level up and upgrade their stats, collect mountains of loot, and use different abilities on the battlefield. Whether you’re playing as a lonely little fantasy child in the solo mode, or viciously bullying goblins in gangs in the online co-op modes, each level’s objective is simple: there’s a crystal on the map; defend it at all costs. Players are then thrust into the level and take part in a “build phase”, in which they construct, repair, and upgrade defences against the oncoming hordes and loot chests hidden around the area for mana to spend on more defences or loot to help in their hacking and slashing. Once ready, the players activate the “combat phase” and all hell breaks loose. Waves of enemies spout from several entrances on the map, headed straight for the oh-so-precious crystal. The players must work together to bash down the bigger enemies, all the while hoping the previously erected barriers and obstacles will be enough to hold the monsters at bay. 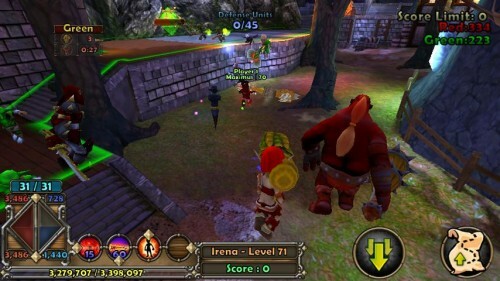 When the carnage subsides, players are again taking part in the “build phase” and can gather their breath, collect some loot, and get ready for the next wave of enemies. Each level has a set number of waves to survive, and the levels do a good job of mixing up the environments so that it doesn’t feel like you’re always defending the same dungeon corridor. Time and time again, the popularity of tower defence games has shown that it’s one of the simplest ways to have fun. 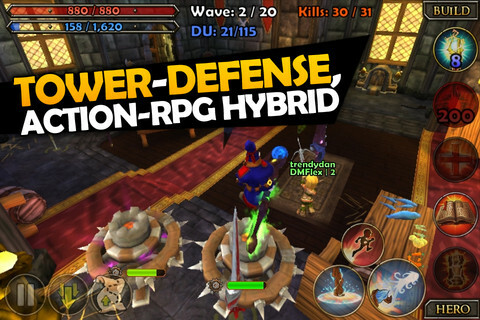 Throw in some action/RPG elements and Dungeon Defenders: Second Wave has got a lot going for it. The frantic pace of the game is fun even when you’re by yourself, and the cooperative plays simply adds to the hectic nature of the game. In fact you could say that the game is too hectic. Not that that would be an issue on home consoles or PC, but the fact is that with nothing but a touch screen acting as the primary replacement for dual analogue sticks, Dungeon Defenders feels a bit slow on the iPhone. My character could move around just fine in most instances, but when any particular finesse of movement was required he became about as easy to manoeuvre as a Mako abandoned on a forgotten Mass Effect planet. In other words, the controls can get a little wonky, sometimes to the point of frustration. The game’s delightful presentation is marred somewhat by performance issues it experiences on the iOS platforms. In the options is a slider for graphical detail, the higher it goes, the choppier the game gets. Even the default low setting occasionally has a few frame-rate issues and stutters. So the fact of the matter is, the game looks great on the higher settings, but doesn’t run all too well on them. In fact it might not run at all if you’ve got an iPhone 3G. The lower settings fix the performance issues, but look far less appealing to the eye, though the cartoon art style redeems all those murky textures somewhat. The game went as far as to crash a couple of times mid-level, which was endlessly frustrating. Naturally, the more recent (and therefore more powerful) an iOS device you own, the better the game will look and run. The game sports great musical orchestration, as the various themes are powerful enough to intensify the action, but not so much that you forget your primary objective when playing Dungeon Defenders: Second Wave: relax and have fun. The portable outing of Dungeon Defenders has a few problems. The controls can be cripplingly hard to handle on the touch screen and the visuals suffered due to the relative lack of power on portable systems. But the fact remains that this is no cheap dime-a-dozen tower defence portable game. This is a full-fledged tower defence action role-playing game, and it never ceases to provide a fun diversion while in the waiting room or on the morning commute (not while you’re driving though, that would be dangerous). What it lacks in finesse, it makes up for in style, and so, the untold fantasy tale of Home Alone 4 is a solid addition to anyone’s App library.